Two or three years ago the Rutland Arms, one of my favourite Sheffield pubs, came up for sale. Excited by the accessible price, me and a few friends talked about forming a consortium and took a look at the deal. It was something like £17,500, I think, which seemed like it might be within reach for a group of us. Only the pub business was for sale (obviously you wouldn’t expect the building as well at that price) and as I saw it, the problem was that the lease was due to expire fairly soon, at which point you might expect the rent to go up and off into the stratosphere. This is where a terrible chill came over my feet. The pub was taken over by the owners of Plug, a nearby corporate music venue, who, it was rather alarmingly whispered, aimed to run it as a ‘pre-club bar’. 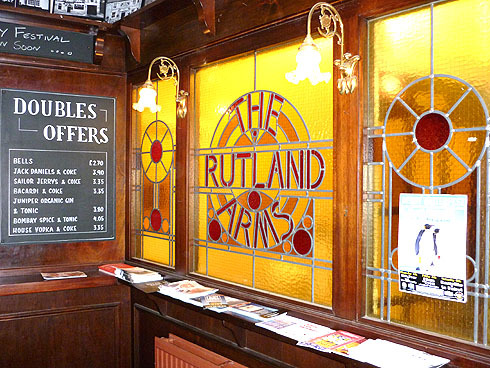 A ‘Save the Rutland’ campaign described it as “a pub of cultural significance”. The Rutland is a grade II listed building, so the new owners couldn’t have changed much if they’d wanted to. When it reopened after a short hiatus, they hadn’t. The quirky collection of ornaments around the picture rail was gone, replaced by ‘moody’ (for which, read ‘dull and mildly pretentious’) black and white prints of jazz and rock musicians. The food was gone, which was a bigger loss: the Rutland’s veggie sausage, spinach and cheese pie was a thing of wonder, much like its sweet potato and bean stew. But that was about it. The big problem, though, was that nobody knew when the pub was supposed to be open. You would arrange to meet people there at, say, seven o’clock on Sunday night, arrive to find the doors locked and lights off, fire off a quick text message and trawl off to the Red Lion instead. Even if you arrived and it was open, so few people had taken the chance on it that the place would feel silent, dusty and dead, and you’d have one pint and move on. And this is deadly for a pub. The decline becomes chronic: every decision to go somewhere else can lead to two or three more. I got there one afternoon to find a member of staff with a suited man taking notes, who might have been a PR consultant, locked in conversation about how to let people know they were actually open. The Rutland earned the nickname ‘the Shutland’, drinkers turned their backs, and the Plug people were ready to cut their losses. Two or three months ago, however, the Rutland re-reopened under new new management. On the evidence so far, they’ve pulled this lovely old city centre pub back from the brink and made it great again. My evidence, admittedly, emerges only from Friday evenings, between about half past five and seven o’clock. I’ve made half a dozen or so visits at these times since the Rutland reopened, guzzling a quick couple of pints between work and home as the weekend revs its engine. Every time, it’s been packed out, humming with chat and shoulder-to-shoulder at the bar. Today, after a week of heavy snow and deeper cold than I’ve ever known, I walk up the steps at the front expecting a diminished turnout. Before I’ve opened the door, the level of sound from inside suggests I am spectacularly wrong. Though it inhabits a large-ish three-storey building (dating, apparently, from 1833), the Rutland is a small, single-room pub, so perhaps it doesn’t take much to build a buzz. Tonight it’s as busy as ever. Office workers cram in from all around, the week’s frustrations with work and weather feeding into a gathering weekend fever. The Rutland is doing what it does best. I squeeze round a table with four or five friends, cradling a smooth, comforting pint of Winter Stout from (I think) the Sheffield Brewery Company and, for the first time all week, feel cheerful. Cheer might even have been upgraded to bliss had the stout not been a few degrees too cold. How do I love thee, the Rutland? Let me count the ways. I love the range of ales: even better now than in its past life, with a good mix between pale and dark, with well-known and obscure breweries. I love the stained glass panels along the back wall inside. I love the way it always feels cosy, whatever the day is doing outside. I always loved the garden – as great as Sheffield is for pubs, the city centre isn’t great for beer gardens – and I hope the new management can get it back to its best. I love the look of the new menu and can’t wait to try the Glamorgan potato cakes. And I quite like it that one of the new people who work here looks a bit like Andrew Flintoff. I love the memories too. 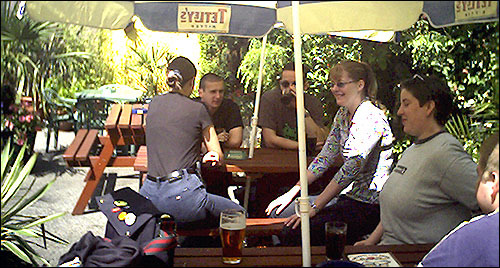 Gathering here with friends for lunch in the garden on the sunny day after a Kelham Island–Shalesmoor–Hillsborough pub crawl in 2002, a couple of years before I moved to Sheffield. A week or two in advance of that eventual relocation, sitting in here on my own with the local paper one afternoon, leafing through the ads for a house to rent. Then as a Sheffielder at last, no end of Friday teatimes, meeting my girlfriend after work for a couple of pints of Landlord and one of those lovely big pies or stews or a scrummy lasagne. Right now we’re huddling to compare our snow stories from the week just ending. After two pints it’s Ian’s round: I ask him for a whisky, planning to leave soon. Sipping it up, the snow starts again and I ponder a further pint. Dobbie’s round is next and he makes the decision for me, bringing another stout back from the bar. It’s getting on for seven when I emerge under an ice-laden tangerine sky, and it must be another three quarters of an hour before my bus home arrives and the driver tells me he’s not going beyond the city centre because of the snow. Somehow I summon the extroversion to share a taxi with another disappointed traveller; maybe it’s the cheer lingering in my bones from an hour and a half in the Rutland Arms. The Rutland really feels like ‘our’ pub. We used it last year (when it was in its transition phase) as our university photography exhibition group HQ, for both pre-exhibition planning meetings, and post-exhibition celebrations. We’ve even had the odd class in there. It’s just around the corner from uni, and it’s great to be able to meet friends (i.e. you and co.) there for a pint after uni, and then bump into some of my friendly tutors who have also returned to it in good numbers since its reopening. It’s a lovely old building as well. It’s not my absolute favourite pub in Sheffield – that is the Kelham Island Tavern – but, when I leave Sheffield, the pub I will reminisce about the most will undoubtedly be The Rutland.